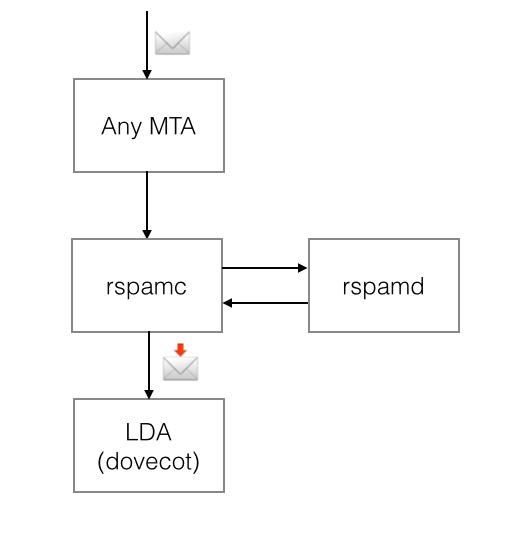 This document also describes the rspamd LDA proxy mode that can be used for any MTA. 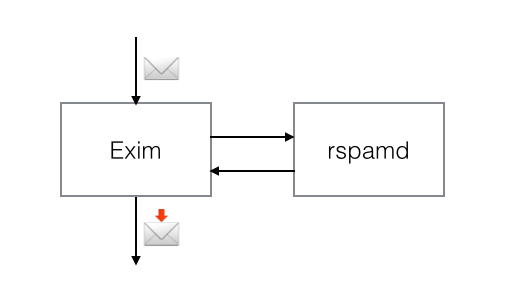 From version 1.6, you should use rspamd proxy worker in Milter mode to integrate Rspamd in Postfix. # prior to Postfix 2.6 the default protocol was 2. For versions 4.70 through 4.84, a patch can be applied to enable integration. In the exim source directory run patch -p1 < ../rspamd/contrib/exim/patch-exim-src_spam.c.diff. For version 4.85, run the following from contrib/exim in the rspamd source directory: patch patch-exim-src_spam.c.diff < patch-exim-src_spam.c.diff.exim-4.85.diff And then follow the steps above to apply the patch. For further information please refer to the Exim specification, especially the chapter about content scanning. Then compile m4 to cf in the usual way. Support for rspamd is available in Haraka v2.7.0+. To enable: add rspamd to the DATA section of your config/plugins file and edit config/rspamd.ini to suit your preferences. Support for rspamd is available from EmailSuccess v11.19. To enable: in the administration console, type filter-module-set rspamd enabled true. Edit filtering options with the filter-module-show rspamd and filter-module-set rspamd commands to suit your preferences. You’ll also need to enable the filter for each input interface (both SMTP and API) with input-set INPUT1 filter enabled, ws-set rest_filter true and ws-set soap_filter true commands. For further information please refer directly to EmailSuccess documentation. mda "/usr/bin/rspamc --mime --exec \"/usr/lib/dovecot/deliver -d %T\""
Please note that despite the fact that this method can be used with any MTA (or even without an MTA), it has more overhead than other methods and it cannot apply certain actions, like greylisting (however, that could also be implemented using external tools).